Dubai: This is one match that lived up to its hype as neighbours as arch-rivals Iran and Iraq played out to a goalless draw in their final Group D match of the 2019 AFC Asian Cup, late on Wednesday. The meeting of the two teams on the pitch has always been emotionally charged. This time was no different as both failed to break the deadlock after 90 minutes of unstoppable action in front of a 15,000-strong boisterous and vociferous crowd at Al Nasr’s Al Maktoum Stadium. Tonight’s result meant both ended with seven points, with Iran owning leadership of the group and along with it the right to meet Palestine, who came through as one of four best-placed teams after being placed third in Group B ahead of winless Syria. Iraq’s second place ensured they will play either Saudi Arabia or Qatar. With nothing on the line except an exciting and charged-up fight to decide a group winner after both had already sealed their spots with two wins each against Vietnam and Yemen, it was Iran starting off on a more menacing note. With Seyed Saman Ghoddoos — who plies his trade with French side Amiens FC — as the key, Iran kept on probing with their first real threat coming up in the 12th minute when Sardar Azmoun’s free header shied away from the Iraqi goal. Iraq slowly started getting hold of proceedings with the 19th minute seeing Mohannad Ali Kadhim sending his header wide despite the hard-working Ahmad Yaseen Gheni lurking behind him. Iran continued pressing and Ghoddoos’ free kick in the 23rd deflected off the Iraqi defensive wall. Both teams got a chance each on goal before half-time. An Iraqi probe in the 35th minute found Ahmad Yaseen Gheni’s left-footed volley heading wide, while Iran’s golden-edge opportunity came three minutes from the breather with a hasty clearance landing at the feet of Ali Reza Jahan Bakhsh Jirandeh, but the Brighton and Albion playmaker hastily banged over. Iraq showed better purpose in the second half and their best opportunity came to pass in the 66th minute, but Kadhim’s stiff grounder went straight into the waiting arms of goalkeeper Ali Reza Safarbeiranvand. 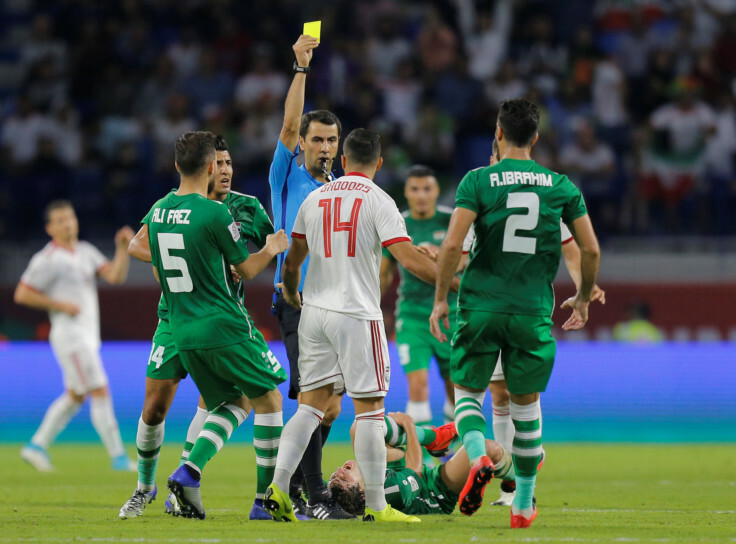 The Iraqis looked headed for a certain goal when an Alaa Abbas Abdul Nabi header in the 77th looked destined for the far corner, but the Iranian goalkeeper came up with one supreme lunge to tip over for an abortive corner. Both coaches brought in attackers in search of that elusive goal. But the defences simply head out till the end with the capacity crowd murmuring away into the night as the ultimate winner after witnessing such an intense match between rivals. The most recent matches between the two teams in this competition was at the 2015 AFC Asian Cup where Iraq knocked out Iran on penalties in the quarter-finals for a third time in a row, with the Iranians aspiring for their first title in more than 40 years. Iran is one of the most successful nations in Asian Cup history with three wins — 1968, 1972 and 1976 — in the 14 occasions that they have featured in starting with their debut at the 1968 edition that they went on to win on home ground. However, after that Iran’s best performance has been four third places — 1980, 1988, 1996 and 2004. Iraq have featured in the AFC Asian Cup on eight occasions from 1972 through to 2015 — where they registered their second best performance with a fourth place. Their best-ever was their historic title in the 2007 edition that was jointly hosted by Indonesia, Malaysia, Thailand and Vietnam.